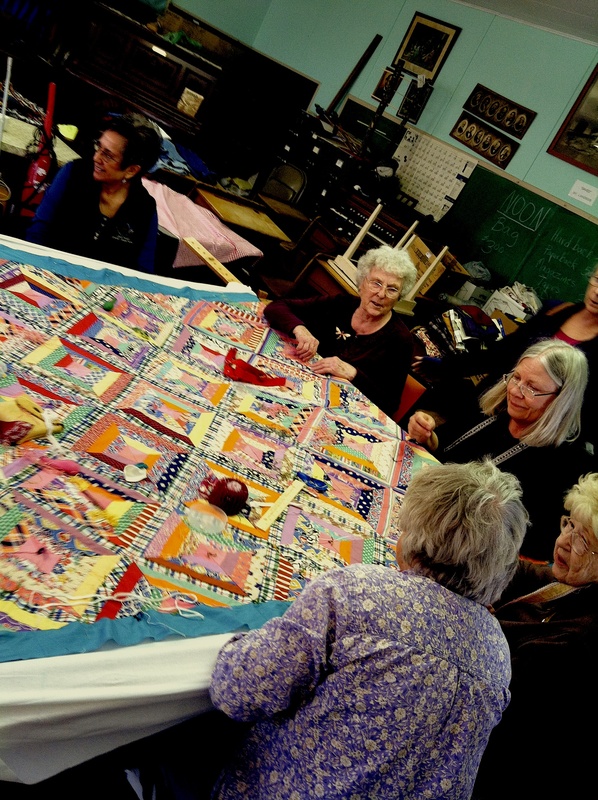 It felt odd at first to have all the quilters sitting around a table rather than around a quilting frame. But I quickly adjusted when they came to my house for lunch. They settled in and were soon telling stories and cracking jokes. Sally brought a heavenly dessert that was creamy with a citrus zing and fresh strawberries. Carmen brought flowers to grace the table. We drank coffee I made so that Joan had a Friday off from supplying coffee for the entire group. Cathy brought some extra chairs so we all had a place to sit. The sun was out and most of our work was finished for the season. On May 16, we had the rummage sale. I haven’t heard yet how much we made from that but any amount helps us toward maintaining the Historical Village. And the Village is looking so lovely these days! The grass is that spring green and the trees have leafed out. Lilacs are starting to bloom. Gary is cleaning up all the buildings so that by Memorial Day weekend the museum can officially open for summer. Hundreds of visitors will pass through learning about the Tobacco Valley and seeing buildings and artifacts from our past. And the upkeep and repairs for all of this mostly come from these women who quilt all winter to raise money. So when you visit the Village this summer, stop by the museum to pick up a raffle ticket for a quilt we made and/or purchase other items that the women created: baby quilts, potholders, dish scrubbers, cards and pine needle baskets. Your support keeps the buildings painted, the lawn mowed, the roofs repaired and the electric bill paid. And have I mentioned the events at the Village this summer? July 26th will have the New Old Time Chautauqua there giving free community workshops from 1:00 – 4:00pm. And then August 2 is the 10th Annual Eureka Montana Quilt Show! If you haven’t been yet, you should definitely put this on your calendar. August 18th is Montana Shakespeare in the Parks at 6pm with “Romeo and Juliet.” The Historical Village gives so much to the community from preserving our heritage to providing a wonderful shady lawn for summer events. Recently when Paul Magid, tour director for the New Old Time Chautauqua, came through to arrange details for the summer, we talked about community building. 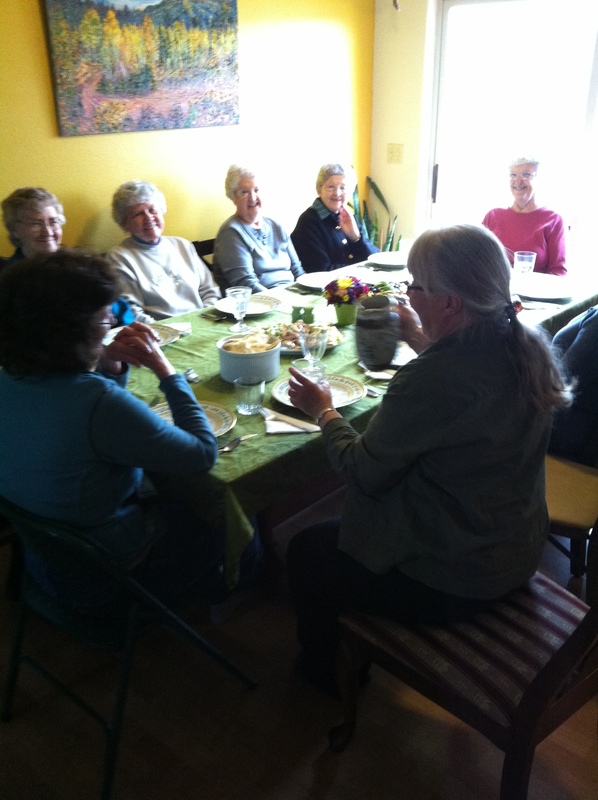 This place and these women as well as the other volunteers with the Board of History truly embody community. I wasn’t sure what we would do when we finished up the last two quilts. There was the book sale on Rendezvous weekend and in only a couple more weeks (May 19) we will have our annual Spring Rummage Sale. I should have known these women would come up with some practical ideas how to fill our Fridays at the Historical Village between these events. We started working on a very unusual quilt – at least to me. Carmen donated the top from her family. Dianne suggested it was made with fabrics from the 1930s. Cathryn brought in lovely shades of embroidery floss that we are using to tie it with. When I showed up on Friday a bit late, Bev was ironing the fabric for the back of the quilt. Cathy, Dianne and Judy were setting up the quilting frame. One of the things I like about the quilt which didn’t necessarily appeal to all the others was that it is irregular. The strips of fabric and the shape of the squares, even the dimensions of the quilt made it a challenge to put onto the quilting frame. Ah but its a beauty! You just know from the warm colors and the splash of designs that it wasn’t pieced in Montana. Even our brightest colors here are a bit somber. But this quilt doesn’t have anything somber about it. We decided that it should be tied with different colored floss so the back (which is an off white fabric) will be a rainbow. The quilters passed threaded needles around so that the colors are thoroughly varied – the dark green and the yellow and the pink and the lavender and the pale green and the dark blue and the white. We didn’t put any batting inside, so the women call it a summer quilt – something that people certainly can use in Montana. Working on this quilt reminded me of a children’s picture book (sorry that I don’t have the title or author) about a woman who makes quilts and leaves them secretly for those in need. I am sure if she made summer quilts, they would look just like this one. Its the kind of quilt that would make you smile the moment you woke up and saw it; the kind of quilt that would let you know it was going to be a very good day.